Scottish Cartoon Art Studio - Neil Drover - agency for live music, presenters and entertainers. Hire a Caricaturists and get a personalised gift caricature. Great fun for Weddings, events and parties; They provide live caricature entertainment and are the first in Scotland to do so digitally with iPad technology (weddings are a speciality); draw comic strips, character designs and illustrations for the web and print; conduct cartoon workshops and much more besides. 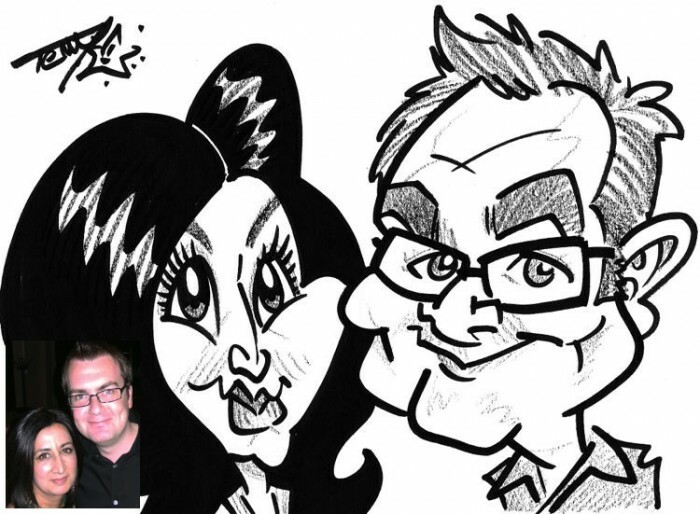 Caricaturist hire, producing quick-fire drawings of guests as entertainment at parties and events of all kinds. Also live digital caricatures using iPad technology, a first in Scotland. Gift caricatures for all occasions created using photos you send us. Large group caricatures – of families, co-workers, sport teams – are a house speciality! Wedding caricatures including large-scale canvases and artwork for stationery. Comic strips for education, information and entertainment. Character designs for advertising and promotional purposes. Illustrations for print and digital media; books, newspapers, magazines, websites etc. Visual minutes capturing discussions in cartoon form for the private and public sectors. Fizzers caricatures, our collection of famous faces. Exhibitions, special events and workshops for children and adults.